For the photometric determinations of various water quality parameters. 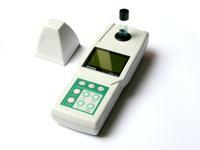 Waterproof handheld photometer with back-lit graphic LC-display. For aquaspex-professional reagents. 9 wavelengths. Infrared connection to PC. Memory for 1000 results with date and time stamp. Software for data upload and calibration curves included.